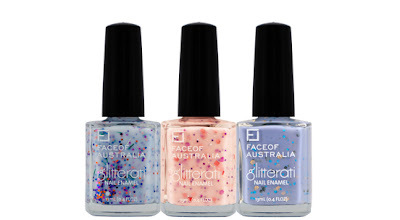 Just a quick post on the new FACE OF AUSTRALIA Glitterai Nail Polish collection, which I believe is a limited edition and has been out for a while now. 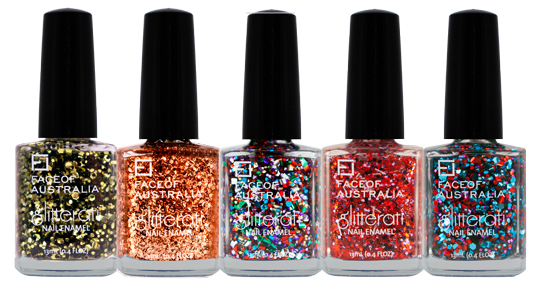 In this collection, there are 8 gorgeous glitter polishes, 5 with a clear base and 3 with a creamy milky base that can be worn on its own. 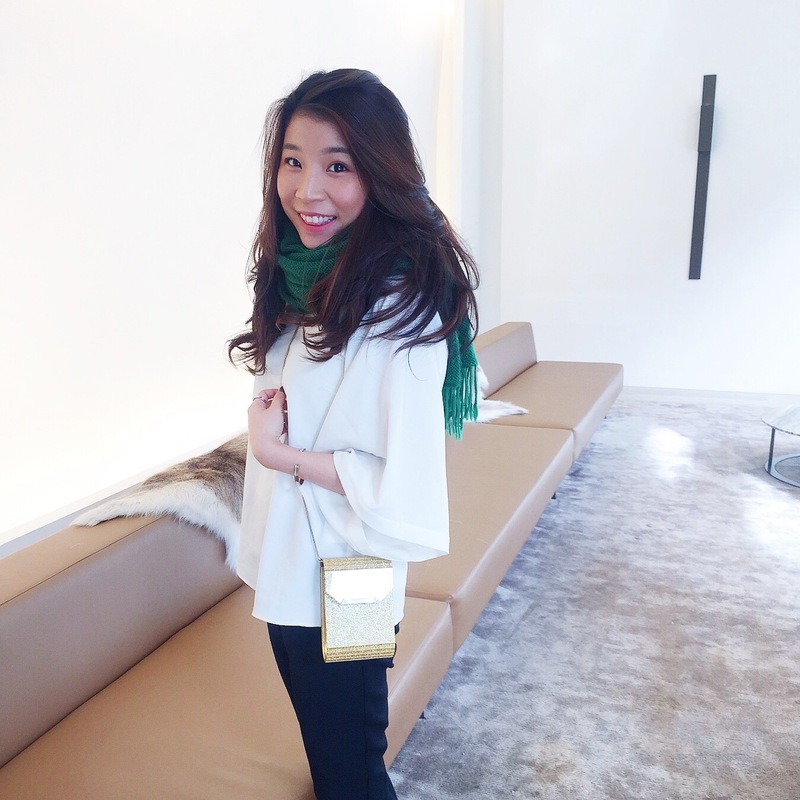 Photos are reposted from Face Of Australia Blog. I recently picked up 5 from the collection, when I was browsing in my local Kmart. I was really excited to see them on the shelves, as I have not been able to find them in Priceline, and that made me wonder if they were Kmart exclusive. These nail polishes are jam packed with glitters, they are really easy to apply. All you have to do is apply a few coats and position the glitters with your brush to the way you desire. They are so girly and fun. Topping your usual manicure with one of the clear base polishes is an easy way to glam up your nails without being too dramatic. Disco Inferno is a playful glitter polish with a clear base coat and has different sizes of hexagons in red, bright blue and purple. With this polish, you can use it as a top coat, or build it up with 4-5 coats and have fun glamorous nails. Heart of Glass is one of the milky base polishes in the collection. The base color is a very pale pastel pink color. It contains pink heart shaped pieces, big red squares and hexagons, tiny squares and hexagons in fuchsia and purple, and some tiny white holographic bar strips. The base is quite sheer, but you can definitely layer 3 coats and get an opaque finish. It is by far the prettiest pastel glitter polish I have ever seen. Boogie Wonderland (the name always make me laugh) is the other milky base polish. 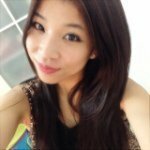 The base is a blue lilac color that is very pretty. It has got big white holographic hexagons, little bar strips in white and green and many tiny hexagons in purple, orange, green, fuchsia and pink (almost all the possible colors). The little bar strips tend to bend and curl up, but it's nothing a top coat can't fix. This is even sheerer than Heart of Glass, so to get full opacity, you will need 5 coats or more. Dancing Queen is very bright gorgeous green olive glitter polish. It has a clear base with different sizes hexagon glitters in two main colors - a dark green and a golden olive. The combination is quite simple, but it surely stands out. You could layer 3 coats of this over a dark polish or even black to get a full sparkly effect. Lookin' for Some Hot Stuff is the one I really looked forward to swatching. The base is clear, it contains black, red and light purple hexagons, little white bar strips and tons of fine red glitters. Once again, it is a very build-able polish. I could imagine layering this on top of a red polish to look very festive and is a different take on the classic red nails. Wow, they're gorgeous! So these are drugstore nail polishes? I've never seen such nice glitter polishes at our drugstore! My favourite is Disco Inferno. So colourful and fun!